In order to have ethical jewelry, we must be able to know if the materials are ethically sourced. 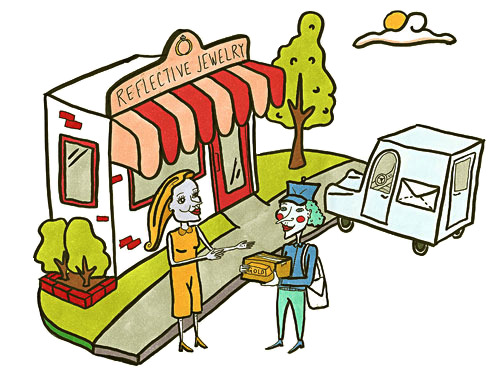 Traceability and transparency in the supply chain are core principles in ethical jewelry sourcing. We need to know, as much as possible, the entire chain of custody, from the mine all the way to our store. There are two main forms of gold: cast grain, which is 24K gold in small beads, and mill products, such as wire, sheet, bezels, and all the small components used to make jewelry. As of October, 2017, we are now able to order our full range of products in Fairtrade Gold, including components we need to make our gold over silver rings. We will be totally replacing our recycled gold components with Fairtrade Gold as soon as possible. *Continue on to the next step in Fairtrade Gold vs Dirty Gold sourcing: Manufacturing. Or return to the previous step: Economy.